“Blame it on Experience” basketball team of Otukpo have been dethroned as Mark d’Ball basketball champions. 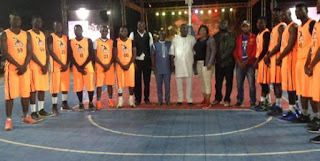 They lost the crown after losing 61-77 to Benue Braves in the final of the competition’s 2017 edition which took place at Mark d’Ball’s newly constructed basketball arena in Otukpo, Benue. Benue Braves reached the final after defeating Zuba Hornets of Suleja 68-57, while Experience defeated compatriots APA Flames 66-55 for the final encounter. It was a sweet revenge for the Brave Boys who were beaten in the final of the same competition by “Blame it on Experience” two years ago. Team Experience made up of veterans in basketball, won the first quarter of the game 22-16 but surrendered to the superior firepower of the Benue team. The Benue team took over the play winning 41-36 and 59-56 in the second and third quarters before sealing victory 77-61 in the fourth quarter. The defeat denied Experience basketball team the opportunity of winning their sixth title in the competition. Captain of Experience, Igoche Mark in an interview with the News Agency of Nigeria (NAN) applauded the performance of the winning team, but blamed poor officiating for his team’s loss. “The match officials made too many wrong calls that affected my team; there should be a balance of officiating in every game for teams to know their capability because we are equal in the court. “Nevertheless, I am happy with the game and its outcome, even though we didn’t win. “I keep telling other teams that it’s a shame that my team takes the title every year we come here despite my teammates not playing active basketball. “The Benue Braves players are younger than us. So, I give it to them,” Mark said. Benue Braves point guard, Michael Ikima, told NAN that it was an honour winning the competition. He said that his mum inspired him to winning the title. “It has always been my dream to lift the Mark d’Ball trophy and we have won it despite the challenges we faced. “Our opponents have the best coaches, former NBA and national team players in their squad but my teammates were able to subdue them; honestly I feel great. “My mum inspired me because I have not won any major title to show that I am a good basketball player; so, I will be glad to tell her now that I won this title. “I have won silver and bronze medals in this tournament but seeing my mother’s face while I was playing the final game, made the difference,” Ikima said. Ikima, a Nigerian Basketball Division One league player expressed the hope that his team would retain the title next season. NAN reports that Customs basketball team from Abuja, won the female title after defeating Benue Providence 56-47 in the female category. Benue Braves were handed the competition’s trophy with a cash prize of N300,000, while Blame it on Experience got N200,000. Zuba Hornets of Suleja and Bayelsa Patriots pocketed N100,000 each for winning the bronze medals in the male and female categories respectively. 10 male and six female basketball teams participated in the competition which started on Dec. 26.